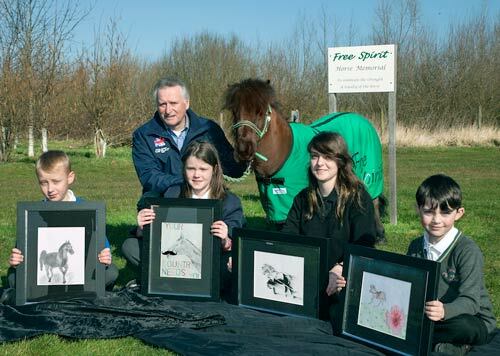 A BID to honour horses at Staffordshire’s National Memorial Arboretum is a step closer to reality after Olympic dressage rider Richard Davison marked the spot where a statue will be sited. Richard was joined by 90-year-old horse lover Lydia Smith, from Shrewsbury, who is one of the driving forces behind the Free Spirit Horse Memorial Appeal to commemorate the service given to humans in conflict by horses and is planning to complete a 50-length sponsored swim to help raise money. Gypsy the Shetland pony, who is a mascot for the campaign, was also at the Arboretum to watch Richard mark the plot with a stake. Lydia was inspired to raise money for a life-sized, bronze horse statue after visiting the Arboretum. The memorial will give visitors a chance to reflect on the wider contribution of the horse to the workplace, sport, rehabilitation and education. Fundraising is being coordinated by Free Spirit Volunteers and a group of horse lovers at Gartmore Riding School, in Hammerwich, who plan to raise £90,000 by 2018. The statue will be created by equine sculptor Georgie Welch.